Any active woman knows how overwhelming the search for a great sports bra can be. There's no shortage of them on the market, but how do you find the right one for your workout and bra size? Thankfully, there's a winner hiding among many of your favorite athletic brands. Whether you need a low-, medium- or high-impact sports bra, there's an option out there for you. To save you some time (and sanity), we dug through online reviews for each of the brands and found the best-selling, top-rated sports bras. 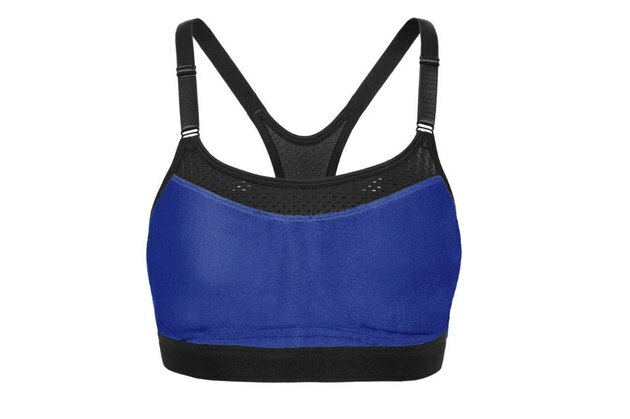 Designed for medium-impact workouts like cycling, hiking, and dance classes, this classic padded sports bra offers sweat-wicking technology and a sporty racerback design. Meanwhile, compression fabric ensures a secure fit. Plus, the material is more than 50-percent recycled polyester — made from plastic bottles diverted from landfills. Here's a bra that was made to keep pace with your every run, HIIT class and weight-lifting session. The Eclipse offers breathable cups, quick-drying fabric and an open-back design with adjustable straps. A next-to-skin fit ensures support without restriction. Thanks to smooth, molded cups, moisture-wicking technology and a wide-bottom band, this bra provides maximum support and breathability for high-impact workouts. Performance mesh in both the front and back keeps you cool, while the front adjustable straps allow you to easily customize your fit. Bonus: No tag! With a mid-rise neckline, you can expect medium coverage that's ideal for medium-impact workouts. This super-soft strappy bra is designed for cup sizes A to C, but it's also available for cup sizes D to DD. Plus, it comes in a variety of fun colors, including teal, red and orange. Padded shoulder straps, molded cups and smooth jersey fabric ensure comfort, while moisture-wicking technology keeps you dry during high-impact exercise, like running and HIIT. Customize your fit with the double hook-and-eye closure in the back. Get high support for A to C cups and lower support for larger cup sizes. Stretchy, moisture-wicking material ensures comfort, while removable cups provide added coverage for your medium-impact workouts (ex. cycling, elliptical). Plus, the sleek, strappy design offers a much-needed touch of fun. This strappy bra provides medium-impact support, as well as moisture-wicking, antimicrobial technology. Smooth cups offer coverage and breathability, while the front adjustable straps and a hook-and-eye back closure ensure a custom fit. Named one of the world's Best Inventions of 2018 by TIME Magazine, PureMove was designed with information gathered from 54 motion sensors (the industry standard is four) and features responsive fabric made to adapt to your every move. What it doesn't have: hooks, underwires, clasps or adjustable straps. This bra is meant to easily slip on and support you throughout your most intense workouts. With flexible, integrated wire, breathable padding and fully adjustable straps, this bra provides maximum support without added weight. And thanks to the sweat-wicking fabric, you'll stay both supported and dry throughout your high-impact workouts (i.e. running, HIIT, boxing). This basic slip-on bralette features soft cotton modal fabric, racerback straps and the iconic Calvin Klein logo on the elasticized band. With no padding or added support, this bralette is ideal for low-impact activities, like yoga and leisure walking.